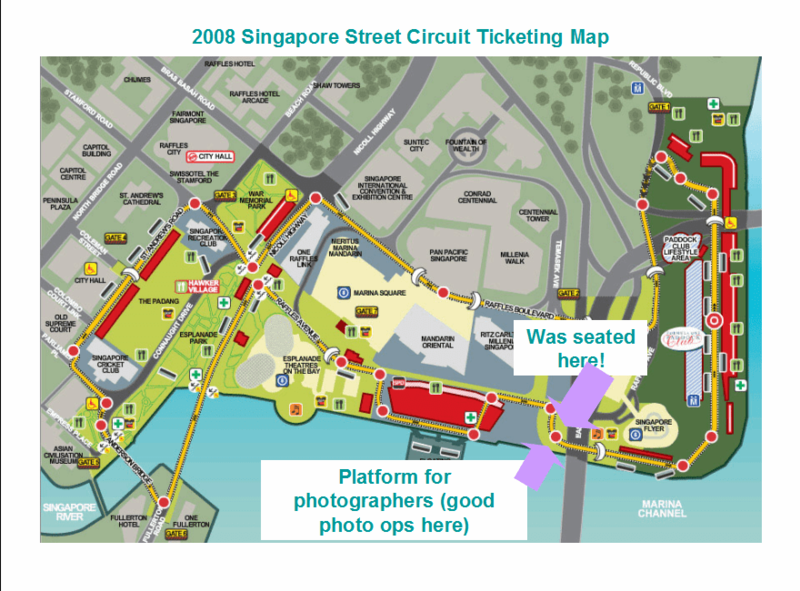 The difference between the Singapore Grand Prix 2008 and 2009 Circuit. …and where to strategically position yourself for the race day! 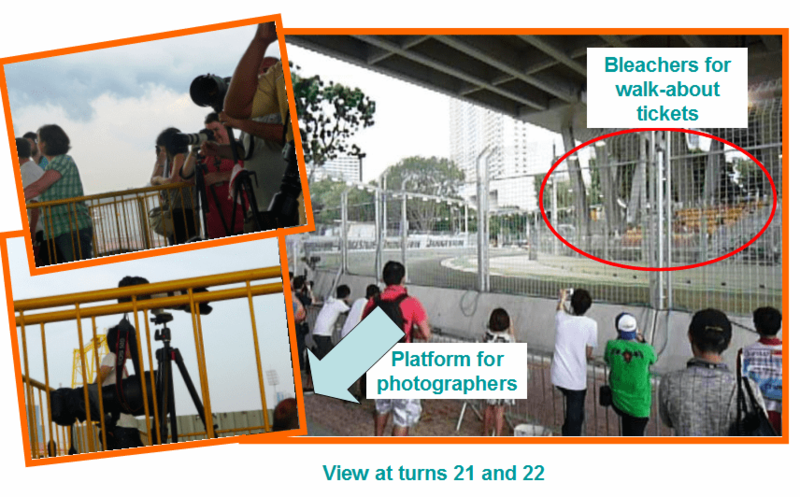 **This is actually a re-post from my previous entry Buy Cheaper Signapore Grand Prix Tickets. The reason I reposted it is because people tend to get lost in my blog and they keep on asking me where the best seats are but they didn’t know I created this post long long ago.Â Plus, I added a little bit more information by the end of the post. Yes indeed this is one of my dissapointments. The main difference between last year’s ticket sales and this year’s is that they no longer offer seats to the Singapore Flyer. This was a total dissapointment for me because to last year, this was where I was stationed. There were great photography opportunities here too since F1 cars slow down on the dangerous curve at Turn 22. Kimi Raikkonen (i think) or Filepe Massa (hehe) they were just coming too fast. This is the view from the bleachers for the walkabout pass. I had the walkabout tickets but they provided here bleacher seats and I deemed myelf lucky!!! I have made the most out of my ticket. Notice the green area for tha walk-about tickets above and compare it with the walk-about tickets on the yellow area below. It’s sad for me that’s why I considered buying the Bay Area Grandstand. If the walk-about area is the same as last year’s I would have still bought the same ticket (only for three days). But potong stim this is >.< I guess it’s one of their marketing / sales tactics. oh well, back to reality. Position yourselves near the turns or the corners!Â You would get a better look at the cars decelerating.Â In the event itself, you will be provided with helpful maps and you won’t be lost here trust me!Â Just get your feet ready for all the walking! Also, you might want to position yourselves near a TV screen.Â This way you will be updated with what’s happening everywhere!Â Last year, I watched the cars pass by me like 10 times, then after that I went out to look for a wide screen!Â Because I don’t know what is happening generally.Â But! If you’re gallant enough you can rent a Kangaroo TV!Â You can bring this device anywhere you are and get updated on the standings, time, I think you would even hear the radio of the different teams and the commentators’ chatter.Â The weekend rental costs 75 euros I think. 1. 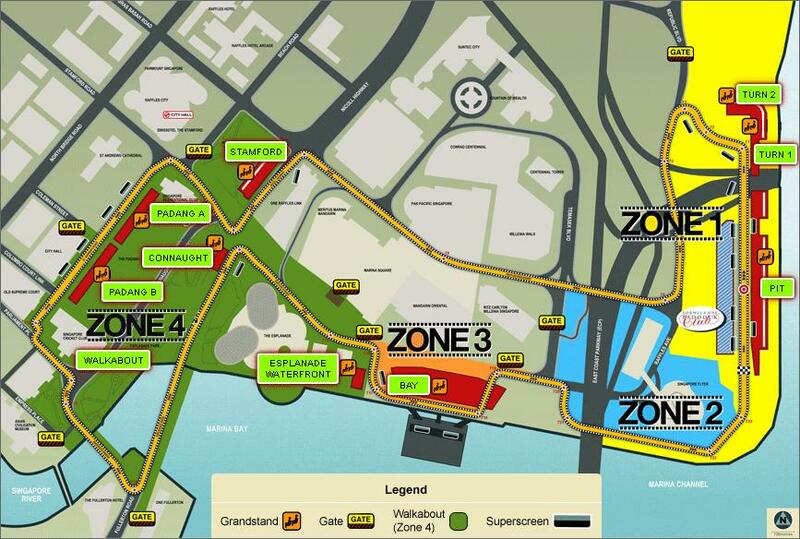 Purchase Singapore Grand Prix tickets here. 2. Singapore Grand Prix Ticketing Release Details. 3. Singapore Grand Prix Early Bird Savings Off 2008 & 2009 Regular Ticket Pricing. 4. 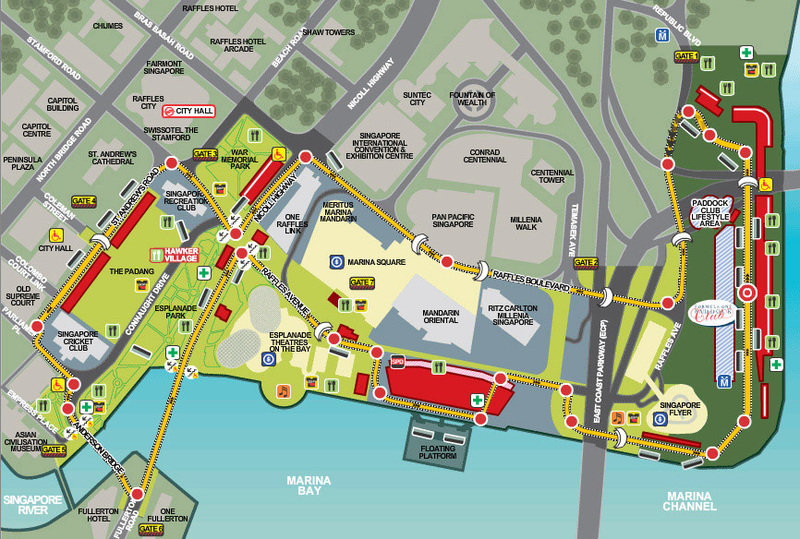 Download the 2009 Singapore Grand Prix night race Circuit map here. 5. Play Formula 1 online. Looks awesome. I wanted to see a racing event like that in the near future rather than on the telly. I’ll keep my eyes open for events like that here in Europe so I can drag my husbandry and see it live if we have free time. S’pore F1 ler, heard the ticket price too expensive! ARE YOU READY TO RUMBLEEEEEEEEEEEEEEEEEEEEEEEEEEEEEEEE!!!! Gentlemen and FlairCandy! START YOUR ENGINE!!! wow, uy congrats for winning the singapore trip by nuffnang ha… hmmm i like that too! !